So what does this have to do with Couscous Almondine? And what is Almondine anyway? Well, one of the stores I shop at daily is Whole Foods Market and I always walk around their prepared foods section. 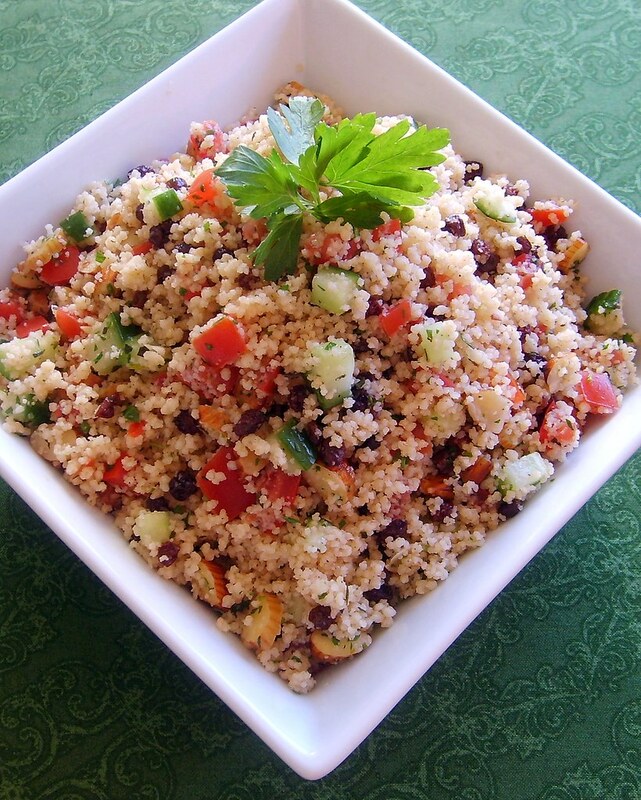 I noticed that they had a new salad called Couscous Almondine and so I decided to make my own version. "Almondine" by the way means "with almonds". So "Couscous Almondine" sounds better than "Couscous with Almonds" and I agree. However, Morocco gets all the credit for pairing almonds or any nut or fruit with couscous. So perhaps the next time that I make this dish, I will omit the tomatoes, cucumber and oregano, and add saffron, cinnamon and cumin and call it "Moroccan Spiced Couscous with Almonds". This sounds so much more exotic, but you'll have to wait until next fall for the recipe! Place couscous in a bowl and drizzle with 2 tsp olive oil and 1/4 tsp salt. Rub mixture together until grains are coated with oil. Bring 1 1/4 cups filtered water to a boil and pour over couscous. Cover with a plate and fluff with a fork after 15 minutes. Chill in the refrigerator until ready to assemble. Prep other ingredients and add to couscous. Toss to combine and season with salt and pepper to taste. Chill for at least 1 hour before serving for flavors to combine. 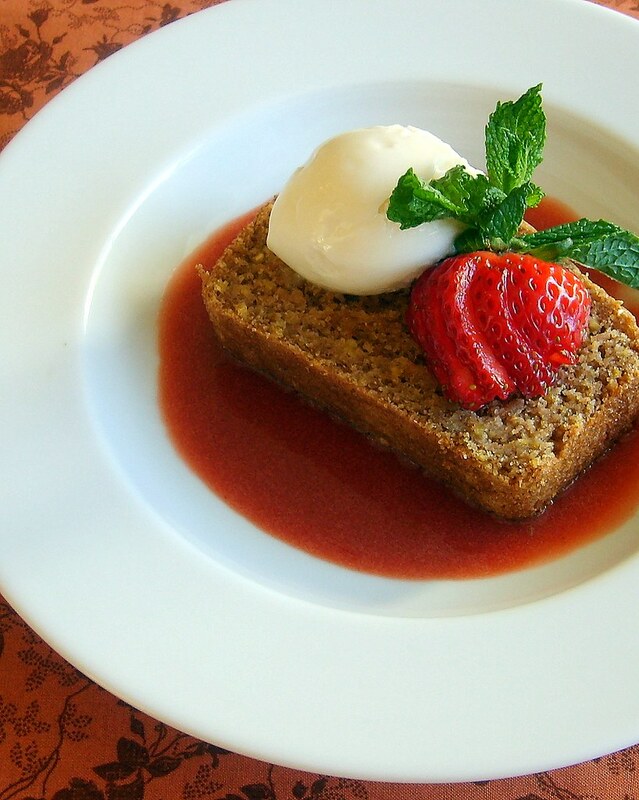 When I worked for the restaurant we used to serve a Cornmeal Pound Cake with Roasted Strawberries for dessert. So I thought that this would be a great recipe to "Veganize" and make it healthy. The original recipe's ingredients included: butter, eggs, buttermilk, white sugar, all purpose flour and high fructose corn syrup. No wonder that we have an obesity epidemic in this country, along with soaring rates of diabetes, heart disease and cancer. I can't believe that I ever ate this way--seems so foreign to me now. Even though that this is SO MUCH HEALTHIER (and just as delicious), I still eat sweets in moderation. Sugar is sugar is sugar, but at least I know that this is made with whole grains, has no cholesterol, almost zero saturated fat and uses fresh seasonal fruit! Note: I use whole grain or whole wheat flours in my baking because they have more nutrients and protein than regular all purpose flour, especially spelt. However, using whole wheat products produces a darker grain, which I happen to prefer. If you want your pound cake to be a little lighter in color then switch to a white spelt flour instead. Pre-heat oven to 350 degrees and lightly spray a standard loaf pan with canola spray and line the bottom with parchment paper. Add flour, cornmeal, baking powder, baking soda and salt in a large bowl. In another bowl, combine maple syrup, melted butter, vanilla extract, almond milk and lemon zest and blend with a hand mixer. In a small bowl, whisk Ener-g Egg Replacer with the filtered water and add to the liquid ingredients and combine. Using a spatula or hand held mixer on low add wet ingredients to dry and mix until combined. Pour into prepared pan and bake on the middle rack for about 30-35 minutes. Check for doneness at 25-30 minutes. Remove cake from the oven and let sit on a cooling rack for 15 minutes before removing from the pan. Add all ingredients to a small sauce pan, bring up to a boil, reduce heat and cook on low for about 5 minutes until strawberries are soft. Strain sauce through a fine mesh strainer and chill in the refrigerator. Serve with sliced fresh strawberries and Organic So Delicious Dairy Free Creamy Vanilla. Enjoy! This soup just screams Spring to me with its beautiful color and freshness. I love the change of seasons when you have an opportunity to cook with new ingredients, especially young, sweet vegetables. I walk through the market and there are so many things that I want to make right now. Not only is it a great time for peas, but also artichokes, carrots, fava beans, fennel, leeks, morel mushrooms and ramps. Looks like I'll be making a Spring vegetable risotto soon! 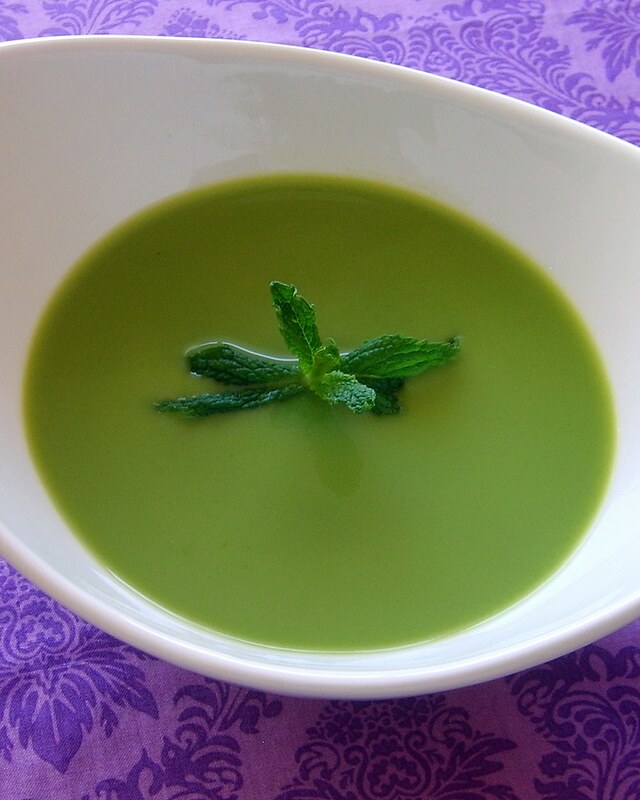 The key to making this soup is not to overcook the peas so that they retain their vibrant green color. This soup is elegant and can be served as a first course for a special dinner, or enjoyed with a loaf of crusty bread. Garnish it with mint oil or white truffle oil, and a squeeze of fresh lemon juice to bring out the natural sweetness of the peas! After you shuck the peas, blanch them in boiling water for about 2-3 minutes until soft and then immediately immerse in an ice bath to set the color. Drain and set aside. If you are using frozen peas, just rinse under cold water to thaw and set aside. In a 5qt pan, heat olive oil, add onion, 1/2 tsp salt and 1/8 tsp pepper and cook on medium-low until onion softens. Be careful not to brown the onion because you don't want to change the color of the soup. Add garlic, flour and stir to combine. Immediately add vegetable broth, bring to a boil, reduce to a simmer and cook on low for 5-10 minutes for flavors to combine. Remove broth from heat, set aside and let cool for about 30 minutes. While the broth is cooking, blanch mint and spinach for about 20 seconds, drain and set aside. Add peas, spinach and mint to broth and blend until smooth in a blender in several batches. Strain broth to remove any skins. The soup should be the consistency of heavy cream. Taste again and adjust seasoning with salt and pepper. Finish with a squeeze of fresh lemon juice. When I'm thinking about what I want to make for dinner, not only do I look though cookbooks, but I also go to restaurant websites and look at their menus. Or when we're out dinning, I'll pick up a menu and save it for future use. When I was in Portland last year visiting family, we went to a cafe called the Blossoming Lotus that serves organic, vegan and sustainable cuisine. I really loved the restaurant. Everything we had was so fresh and flavorful. Anyway, I ordered their Crispy Thai BBQ Wrap and it was yummy and so I decided to make my own version. My photo doesn't do it justice, but if you make this recipe I guarantee you'll be making it over and over again. 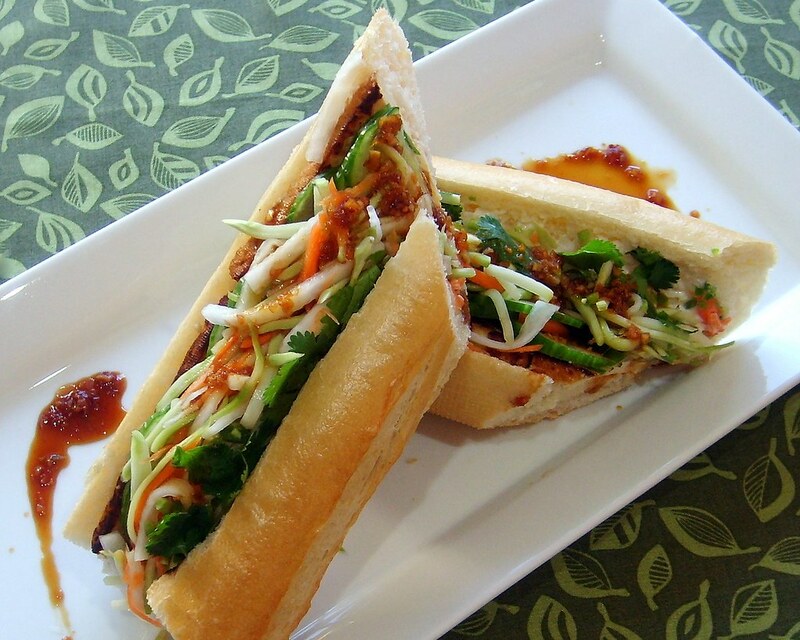 And if you're ever in Portland, stop by the Blossoming Lotus for a really healthy and delicious meal! Note: To save time and money (if you don't have all of the ingredients), you can purchase a bottle of pre-made spicy bbq sauce. Just make sure that it is low in sugar and doesn't contain high-fructose corn syrup. Add all ingredients into a small sauce pan and simmer on medium-low for about 15-20 minutes until flavors combine. Makes about 1 cup. Add ingredients to a small bowl and whisk to combine. Remove rice sticks from the package and crumble or cut into smaller 3-4" pieces. Heat a large frying pan on medium heat and add 1 tbsp canola oil. Working in small quantities, spread a thin layer of the rice noodles in the pan and cook until they puff up in size about 1 minute. Be careful not to burn. Remove them immediately from the pan and place on paper towels to drain off any excess oil. Season with a little salt and repeat process. Rehydrate soy curls according to package, drain really well and toss with some bbq sauce and set aside. Warm tortillas briefly and layer with all the ingredients. Drizzle with sweet ginger sauce and more bbq sauce. Fold up like a burrito and cut on a bias. 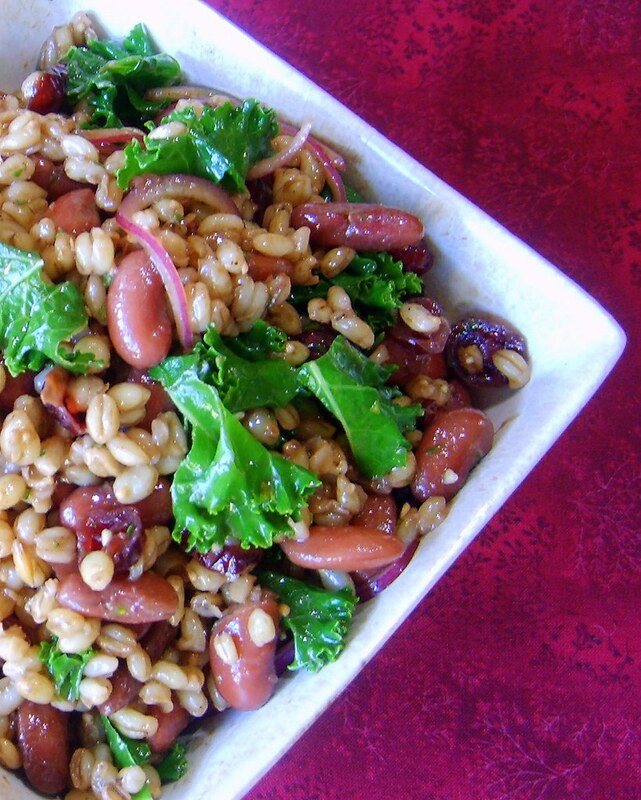 Serve with sweet ginger sauce on the side and a fresh salad! Before I switched to a plant-based diet, I never ate eggs. I didn't like the texture, or the taste. Plus, I had really high cholesterol and so I never wanted to aggravate the situation. I also was really bothered by the horrendous conditions in which hens live on factory farms and so it just didn't feel right to me. 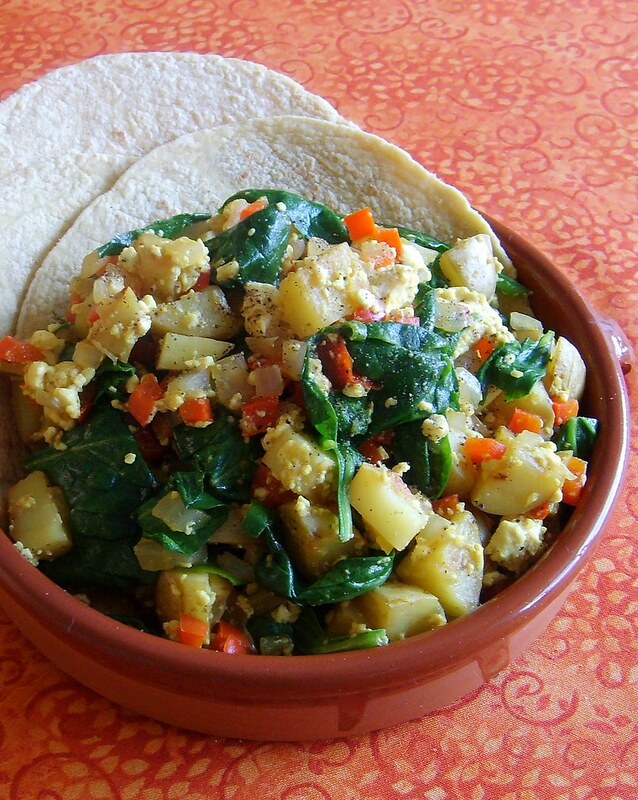 This tofu veggie hash has no cholesterol, is low in saturated fat, is high in protein, potassium, iron and fiber. So for all the egg eaters out there, I'd like you to give this recipe a try and I hope that you'll never eat eggs your way again. I mean, why would you when this is so delicious and good for you! And good for the chickens too! I usually make this for a Sunday breakfast or a quick dinner. I like serving it with corn or whole wheat tortillas and spicy salsa. Also, feel free to add any vegetables you like--it will only get healthier! Broccoli and shiitake mushrooms would be a nice addition! 1-2 pounds baby Yukon gold or baby red potatoes, rinsed well and diced. In a large frying pan, heat canola oil on medium heat, add potatoes and cook for 10-15 minutes until they start to soften and brown. Add bell peppers and onion, season with salt and pepper and cook for about 10 minutes more until potatoes are fully cooked. Stir frequently so that potatoes do not burn and add some vegetable stock if it seems dry. While potatoes are cooking, drain tofu and place in a large bowl and mash with a fork. Stir in black salt and turmeric. When the potatoes and peppers are finished, add tofu and spinach and cook until spinach is wilted and everything is combined. Check for seasonings and add salt and pepper if needed. Whenever I feel like I'm not eating enough leafy greens or vegetables and I feel like I'm consuming way too much of the other stuff, I know that it's time to make Bibimbap. Actually, I usually try to make a day of eating incredibly healthy with no added oils or salt in my cooking. For instance, here's a sample of what I ate yesterday and I feel so much better for it. And today I'm on track for another really healthy day! Not that I ever really eat unhealthy, but some days I may not eat enough of the green stuff and yesterday, I know that I did. And it was delicious! 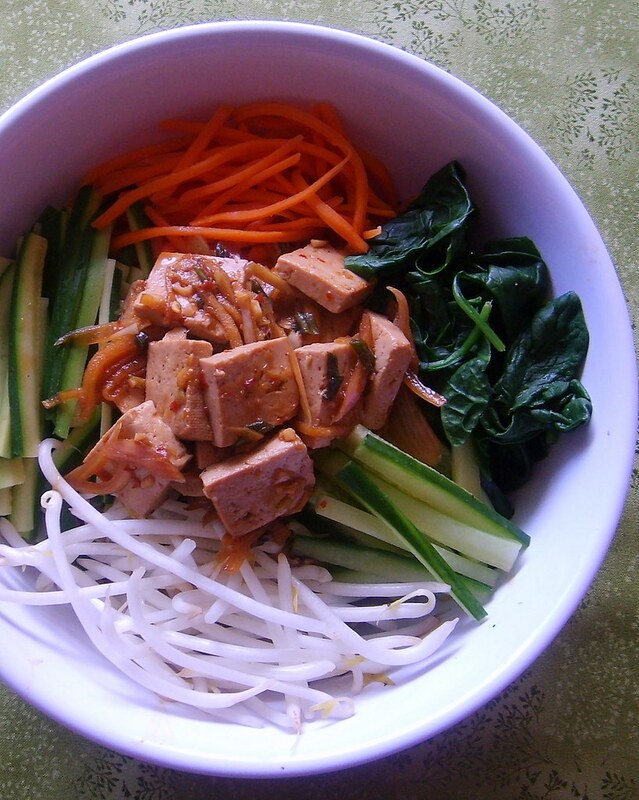 You can make Bibimbap as simple or as complicated as you like. When I say complicated, I'm referring to the tofu marinade. You can purchase already marinated baked tofu, or make your own. Also, use any combination of vegetables you like. These are veggies typically used in this dish and I happen to like how they all work together with texture and color. Whisk all ingredients in a bowl. Add tofu and let marinate for at least 30 minutes while you prepare the other ingredients. Cook rice according to package, fluff with a fork when finished and set aside. Steam the carrots, zucchini and spinach separately for about 1-2 minutes maximum. They should still have a crunch and be bright in color. You can also steam the mung bean sprouts but I don't. I prefer them to remain really crunchy and bright white. This goes for the cucumbers as well. Pour tofu and marinade into a sauce pan and heat on medium for about five minutes until onions are soft. 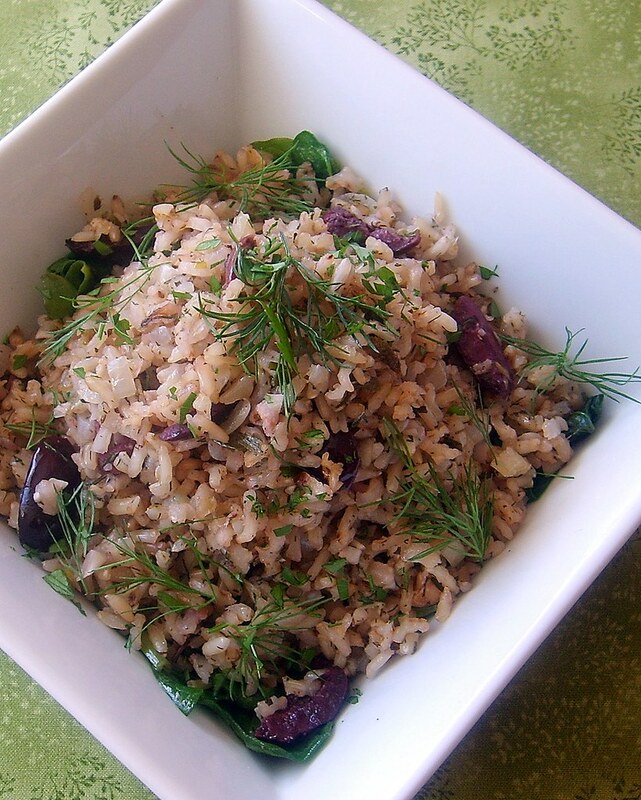 Place rice in the bottom of a large bowl, top with all other ingredients and serve with chili sauce (below). I can't tell you how many times I've eaten falafels. I love them, but I don't like the fact that they are deep fried! So I end up making them at home. Still, I have a hard time resisting and a new falafel restaurant is opening two miles from my house and so I'll have to go and check it out. 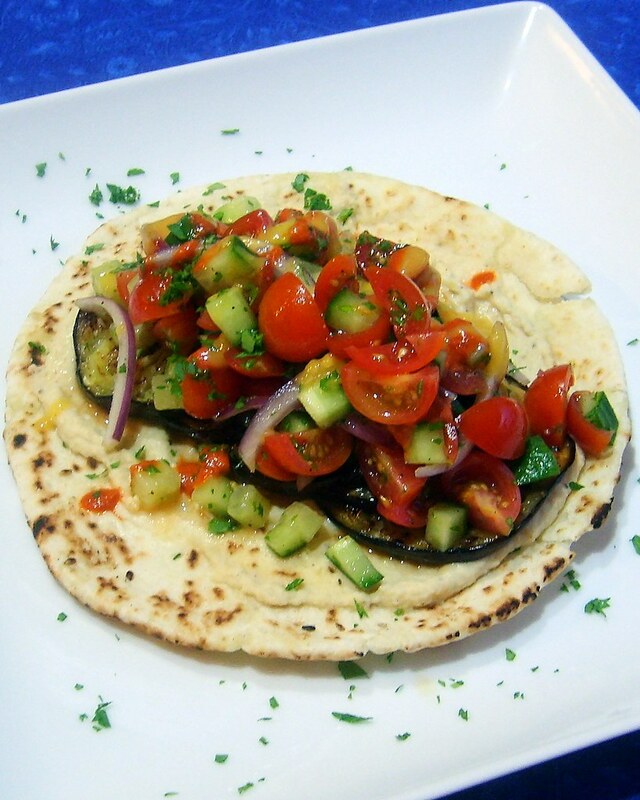 In the meantime, this Sabich Grilled Eggplant pita that I made for dinner last night is my new go to favorite! I can't believe that I've never made this before--the flavors are just amazing together. It's smokey, spicy, tangy, crunchy and so simple to make. And for those of you who don't like eggplant, this will convert you! Note: You can make the hummus from scratch, like I did. You just need a food processor, cooked chickpeas, fresh garlic, tahini sauce, cumin powder, lemon juice and salt and pepper. However, there are a lot of good brands of hummus in the grocery stores, so find a brand that you like and use it. I also made my own harissa, a North African hot sauce, but you can purchase that as well, or use Sriracha or any hot sauce you like. The one ingredient that I hope you can find for this dish is the Amba. I've never tasted anything like it before and it is very hard to describe. It's pungent, spicy, sweet, sour and salty and when mixed with the other ingredients in the wrap it goes so well together. If you can't find it at a Middle Eastern market, then just purchase kosher dill pickles and dice them. I also blended my Amba with a little water in the blender to create a sauce instead of using it right out of the jar. Slice eggplants thinly 1/8"-1/4" rounds. Brush both sides of eggplant lightly with olive oil and sprinkle with salt and pepper. Heat a flat griddle iron on medium-high heat and brush lightly with olive oil and place eggplant slices on the griddle. Cook on both sides until golden brown. Place on paper towels to remove excess oil. Set aside. Combine cut tomatoes, diced cucumber, sliced red onion and minced parsley in a bowl and toss with lemon juice, a drizzle of olive oil and salt and pepper. Heat pita bread in the oven or a toaster oven until warm and soft and brush lightly with olive oil. Layer the pita starting with the hummus, eggplant, tomato-cucumber salad, hot sauce and finish with the Amba or pickles. You can also finish with a drizzle of tahini sauce if you wish. 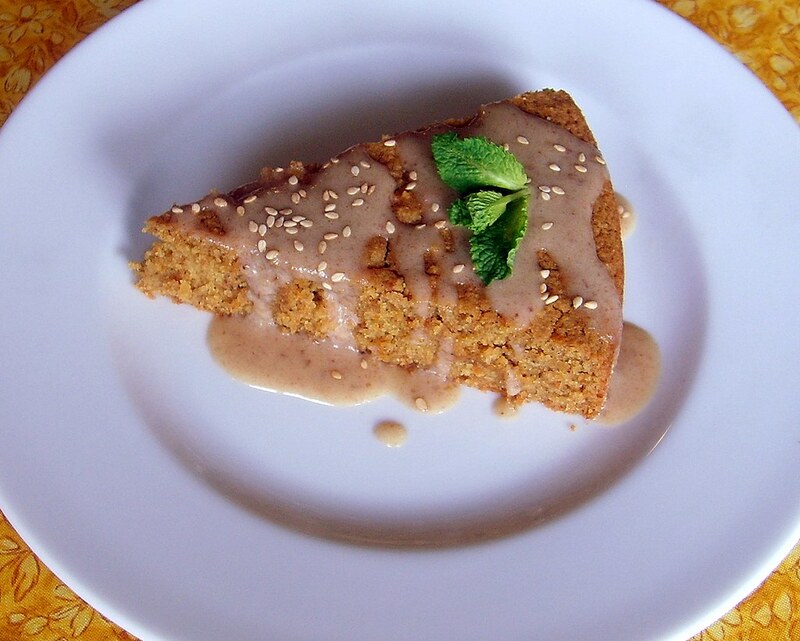 I love simply prepared cakes and a slice of this tahini cake is just perfect. It's dense, but incredibly moist. It has a nutty flavor from the tahini and an underlying sweetness from the dates and maple syrup. I could eat the whole cake (serves 8), but I decided not to and save a piece for my husband. Serve this cake anytime with a cup of authentic Greek coffee, or a shot of Raki and you're all set! Just delicious and so easy to make! Takes me back to Crete! Lightly oil and flour a 9" cake pan and set aside. Whisk together all dry ingredients in a large bowl, set aside. In a blender or food processor add the remaining ingredients and blend until smooth. Add wet ingredients to dry and mix by hand until smooth. Pour into prepared cake pan and bake for about 30 minutes until cake pulls away from the side of the pan and toothpick inserted comes out clean. Let cool on a cake rack for about 15 minutes before removing. Remove pit from dates and cut into quarters. Place dates in a bowl and cover with boiling water. Let sit covered for 30 minutes until soft, then drain off water. In a blender or food processor add all ingredients and blend until smooth. Drizzle glaze over cake and sprinkle with toasted sesame seeds. This TLT wrap is just delicious! I think that this is the best wrap/sandwich I've ever made! You can purchase marinated smoked tempeh strips, but I find them to be too salty and overpowering. And it's so easy to make your own marinated tempeh and less expensive too! Whisk all ingredients in a bowl and set aside. Remove tempeh from the package and slice in in half. Place in a steamer basket and steam covered for 20 minutes. Remove from pan and let cool before cutting into 1/8" strips. Place tempeh strips in a rectangular baking dish and cover with marinade. Let marinate for about an hour turning to coat all sides. Remove from marinade and pat dry on a paper towel. Save marinade. Heat non-stick saute pan on medium heat and coat lightly with canola oil. Fry tempeh strips until golden brown and slightly crunchy about 3-4 minutes on each side. Pour remaining marinade into a small sauce pan and reduce until it coats the back of a spoon. Coat the entire sheet of lavash with 1-2 tbsp ranch dressing. Place 6-8 strips of tempeh length wise on the bottom of the wrap. Cover with chopped romaine and tomatoes and sprinkle with salt and pepper. Fold up lavash like a burrito and slice in half on a bias. 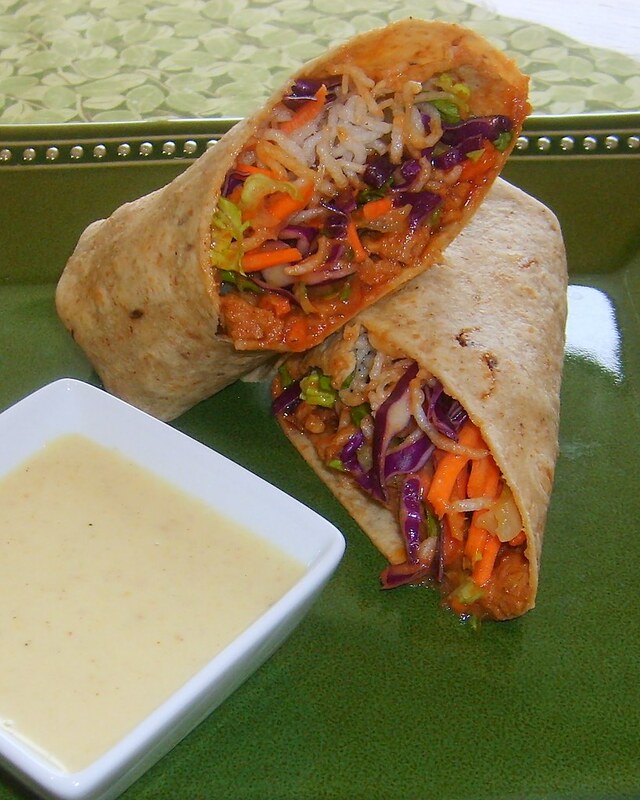 Mix 2 tbsp maple glaze and 2 tbsp ranch dressing together in a bowl and drizzle over wrap. 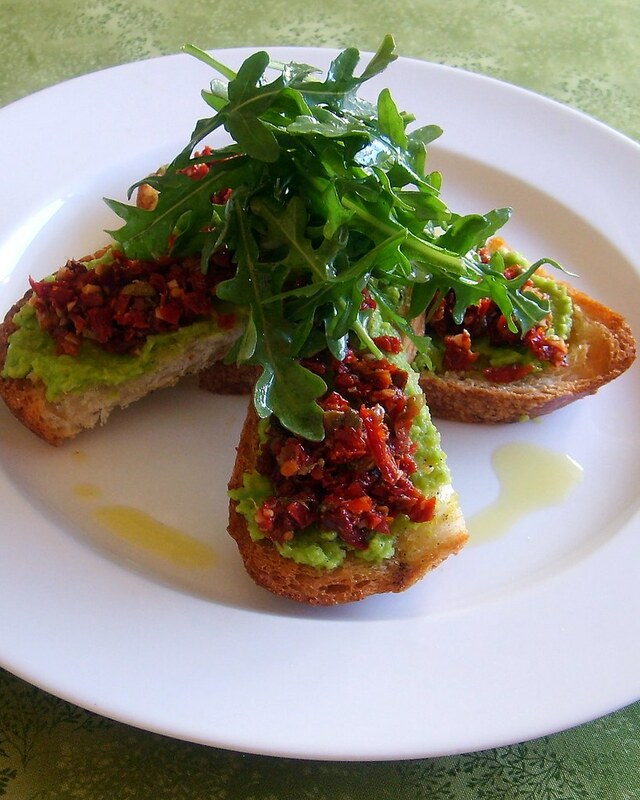 Serve with a mixed greens salad and enjoy!